If I could construct a dress a month, I’d be very happy! A harmless, cheerful collection of words, yes? But the words became stuck in my head and refused to move. They hung around and made themselves at home, until at last they settled into a slightly different arrangement: If I could construct a dress a month, I’d have twelve new dresses by Christmas! And once I realised that, there was no turning back. It almost seemed as though I had little choice in the matter, as the blogging world appeared to be in complete agreement with my devious voice. I kept coming across blog after blog where the writer was embarking upon a dress-a-month project for 2015. It was as though fate had decided subtlety was not for me and GREAT BIG CLUES were clearly the way to go. So I gave in and I hereby present to you the Delightful Dozen Project. Basically, the Delightful Dozen Project involves making one garment per month from the pool of patterns above. Initially, I planned to make twelve dresses, but then I thought it might be handy to add different garments to my wardrobe. This was a difficult concept to grasp, given that I wear dresses ninety-nine percent of the time. There’s just one problem: my wardrobe. It’s not exactly empty. In fact, every time I open it, I marvel at the fact that the rail is managing to stay up. Can it really cope with a steady influx of new clothes? The odds are against it… so what to do? The answer is simple: I’ll replace them! Ever since I’ve started making my own dresses, I’ve discovered the delight of wearing garments where the waistline is at my waist, and not two inches above it (which is my normal experiece with store-bought dresses). The down side of this wonderful development is that wearing my old dresses drives me crazy, with their stupid waists in the wrong place. 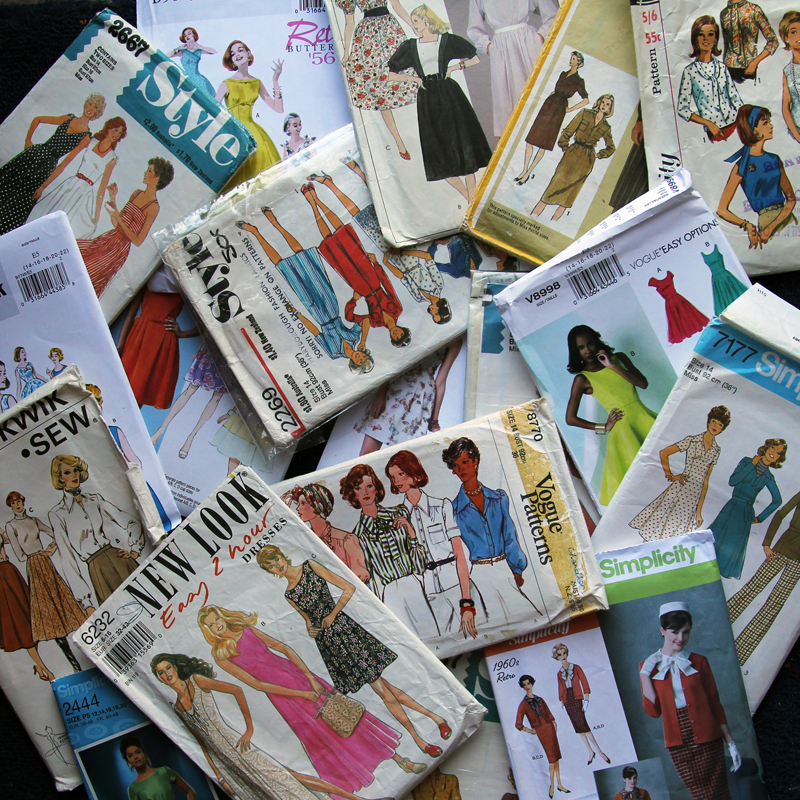 So the second step of the Delightful Dozen Project is to choose an old garment (or two… or possibly three) to replace with each newly-made one. Not only will I avoid stuffing my wardrobe to some sort of implosion point, I’ll be ridding myself of dresses that don’t fit properly or aren’t really flattering. That is the Delightful Dozen Project in its simple entirity. If things go to plan, I should have twelve new garments hanging in my wardrobe by the end of the year. Wish me luck! Thanks! I have quite a few retro Buttericks – even when I buy new, I like to buy old. 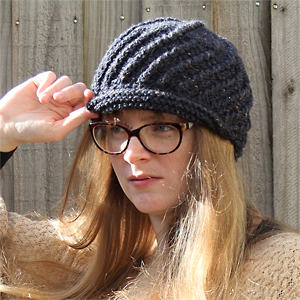 Isn’t it lovely to make something that fits you, rather than trying to fit ourselves into clothes with arbitrary sizes? It might take a bit more effort than going to a shop and trying things on, but it’s so worth it in the end. I hope you’re having fun with it. Thanks! It was hard to narrow the selection down to just that pile but I felt I needed a little limitation or I’d spend most of each month trying to decide which pattern to use. Honestly, I’m sick of the amount of clothes I have in my wardrobe, many of which I don’t even wear, so this seemed like the best way to address that issue. Dolce & Gabbana, Dior, Chanel, Gucci, Versace. Katie Gatward. Yep, it has a nice ring to it as fashion designer. Just make sure I get a good seat in the front row. 😉 And I want a backstage pass so I can indulge myself with French champagne and canapes…. Well, maybe if I become crazy and decide to design dresses as well as simply making them. Which is not out of the realms of possibility, given that I declared just a year ago that sewing things wasn’t my thing. Nope. Not at all. Absolutely! The responses to the project have been so lovely and encouraging – I’m full of inspiration already! Oh Katie, you are marvellous! I’m glad my words have inspired you so. I’m looking forward to seeing your creations indeed! Those patterns, my word that is a collection! And, there is nothing worse than an ill-fitting garment. But you’re not going to have that problem any more, hooray! It’s a readily-growing collection of patterns! I always find so many treasures in op shops and I never want to leave them behind, especially the super old ones. I really do have to thank you for making that comment – it seemed to be exactly the thing I needed to hear! It’s rather liberating, isn’t it? While it might take a little longer to sew something yourself, in the long run it makes more sense because you have a dress that’s tailor-made for you and is a pleasure to wear. Plus, I love knowing I’m wearing something unique (this may be a little vain, but I don’t care!). That was my initial thought: a garment a month is definitely an achievable target! We’ll see what I’m saying come the 31st of December, however (although I’m secretly hoping I’ll be able to make a couple of extra garments along the way). Op shop patterns are the best! I love walking into an op shop and finding baskets stuffed full of potential treasures, and I particularly enjoy finding patterns with notes on them from the person who originally used them to make something. But yes, you do encounter the occasional tragedy of discovering there’s a vital piece missing. It would be wonderful to know someone else is playing along as well! Exactly the same problem. I love sewing (and opshopping!!) but I have so many clothes already… although a lot of them are not quite right for one reason or another. MUST GET RID OF SOME. Aggh. They contain such hope, though! One day, that dress will magically suit me… One day, that skirt will go with something – anything – in my wardrobe… I’m hoping it will be a good experience!